Feeding infants with high-protein formula increases the risk of developing excess body fat by the age of 6. Moreover, in many such cases, Body Mass Index (BMI) does not reflect the true level of body fat, as LMU researchers have now shown. The composition of the food that we receive in our first year of life has a persistent impact on health in later life. By programming long-term metabolic responses, early nutrition has a significant influence on the risk of becoming overweight or obese, conditions which themselves have wide-ranging and deleterious consequences for health. While rapid weight gain in early childhood is known to be one of the major risk factors for obesity, the overall level of body fat also plays a role – and this parameter does not necessarily correlate with body weight. Now, researchers led by LMU’s Professor Berthold Koletzko, who heads the Division of Metabolic and Nutritional Medicine at Dr. von Hauner‘s Children’s Hospital, have looked at the effects of the protein levels in infant formula on body composition at the age of 6 years. Their results are reported in the journal Obesity. Earlier studies by Koletzko and colleagues had already measured the impact of this factor on weight gain in young children. “In the context of an international project, we were able to show that children who received infant formula containing high levels of protein gained more weight during the first year of life and had a higher body mass index (BMI) at the age of 6 years than did infants who were fed with lower levels of protein,” says Koletzko. Rapid weight gain in the course of the first year is a known risk factor for obesity. However, excess body fat could in fact play an even greater role in this than body weight per se. In their latest retrospective study, Koletzko and his team focused on the accumulation of body fat, rather than body mass. To estimate levels of body fat, they analyzed data (obtained over a period of 6 years from the same study population as before) based on measurements of skin-fold thickness. 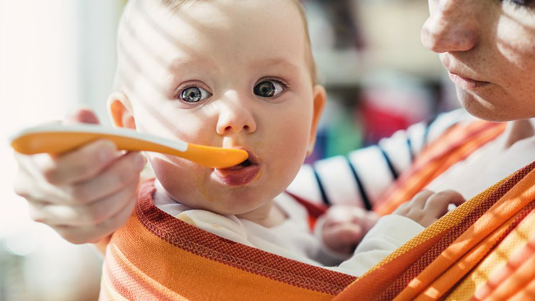 The results show that the children who received high-protein formula as infants had higher levels of body fat at the ages of 2 and 6 years than those whose early diet was less protein-rich. Consumption of the high-protein formula was found to double the chance that children would develop excess body fat by the age of 6. “Furthermore, half of those who were found to be carrying excess body fat at that age had a normal BMI,” says Koletzko. These findings suggest that it would be clinically more effective to use the Fat Mass Index (FMI) to identify children with excess fat than to focus on the BMI. And in order to avoid an early build-up of excess body fat, Koletzko and his colleagues recommend that children who are not breast-fed should receive infant formula that contains the same level of protein as human milk.